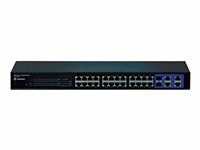 TRENDnet’s fanless 24-Port 10/100 Mbps Web Smart Switch, model TEG-424WS, offers 24 x 10/100 Mbps ports, 4 x Gigabit uplink ports, 2 x shared SFP slots, and a 12.8 Gbps switching capacity. 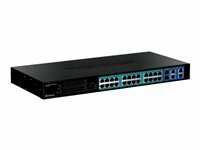 This IPv6 ready switch offers advanced traffic management, troubleshooting, access control, energy saving GREENnet, and monitoring features at a reduced cost. 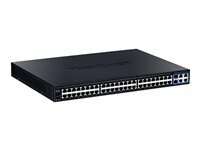 TRENDnet’s fanless 48-Port 10/100 Mbps Web Smart Switch, model TEG-2248WS, offers 48 x 10/100 Mbps ports, 4 x Gigabit ports, 2 x shared SFP slots, and a 17.6 Gbps switching capacity. This IPv6 ready switch offers advanced traffic management, troubleshooting, access control, energy saving GREENnet, and monitoring features at a reduced cost.